Key West - 40 kt winds! Key West - To the beach! 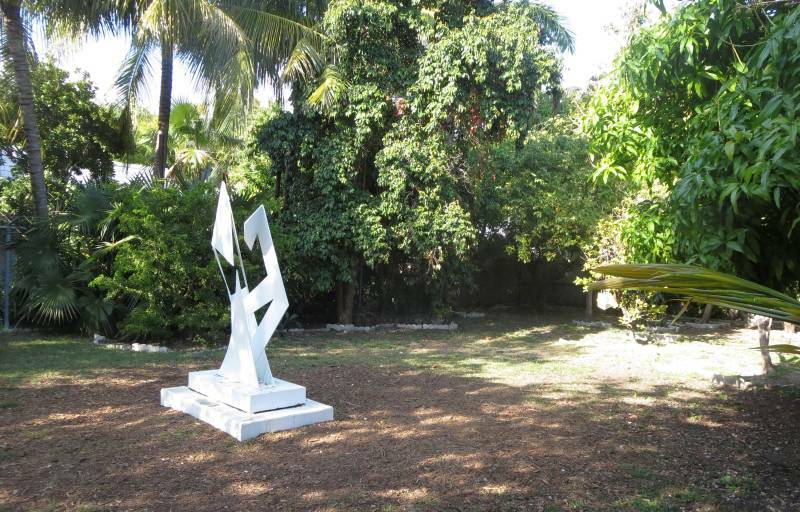 Key West has a several "Pocket Parks" which consists of a plot of land about the size of a typical lot that a house would be on but it's vacant. The city landscapes the area for a park, complete with a sculpture and seats. I visited the one today on Grinnell Street thinking it would be good for Hoolie to use for exercise but the sign out front said dogs had to be on a leash at all times. Oh well, it's still an area for Hoolie to explore although the only thing he ever looks for is food. You think Hoolie likes you, wrong, you are just a potential source of food! No food, then he moves on. The park is next to the island cemetery. This is another area like New Orleans where most of the graves are above ground. By Key West standards, the area is huge, covering several city blocks. We moved on and did some tarpon watching. 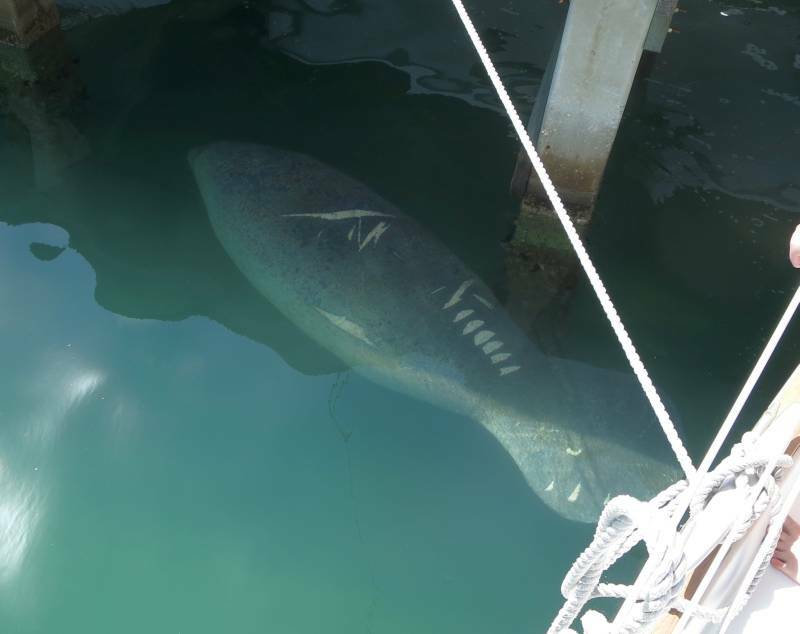 There are dozens of tarpons in the harbor, they are attracted by the free handouts meant for the pelicans but they often miss and then it's gone via the tarpons. 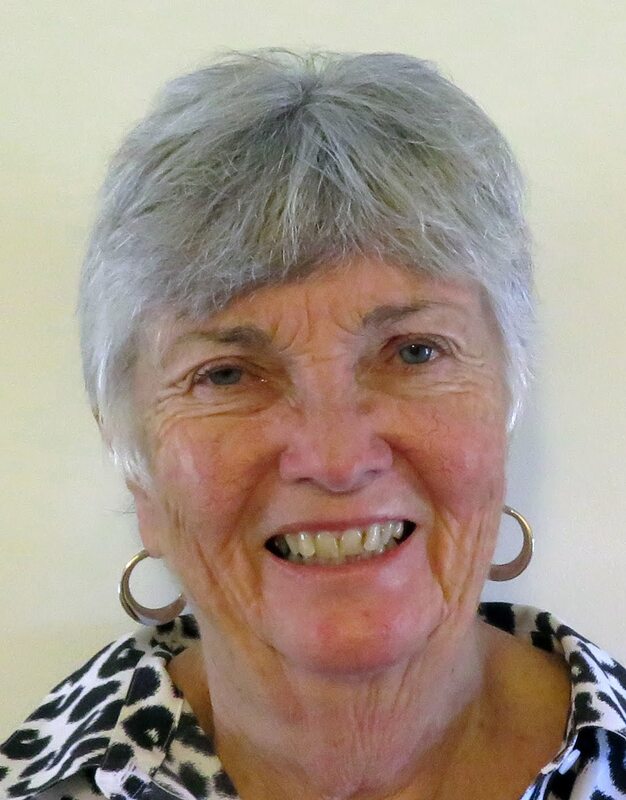 Yesterday's mystery blossom was solved by Marie Hughes of Connecticut. 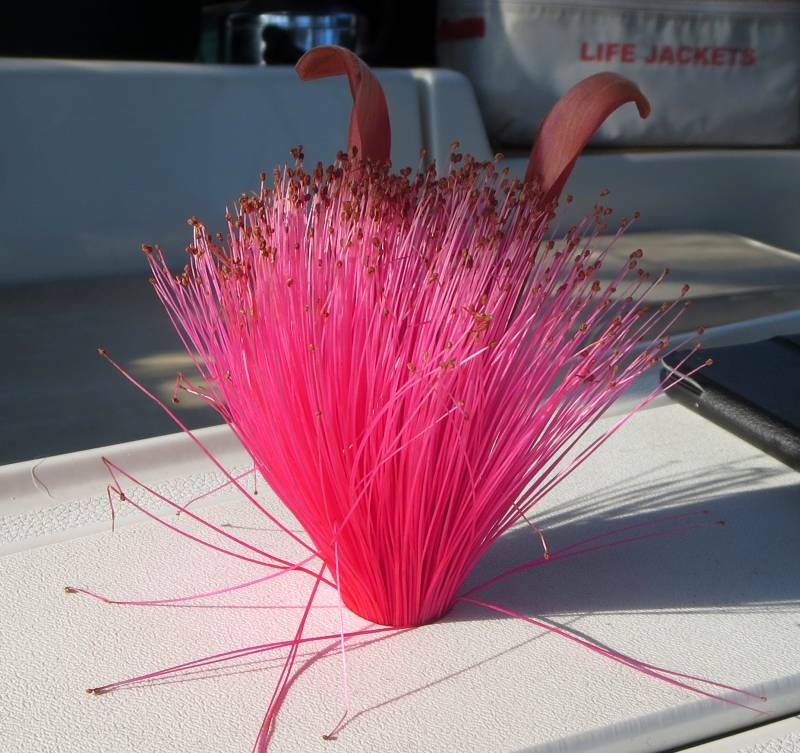 It's a Shaving Brush Tree. Apparently it can grow as tall as 50 to 70 feet. It's quite stunning. We are just enjoying the good weather and waiting for the north to warm up, there's no hurry to return to the cold. Mystery blossom, can you ID it? 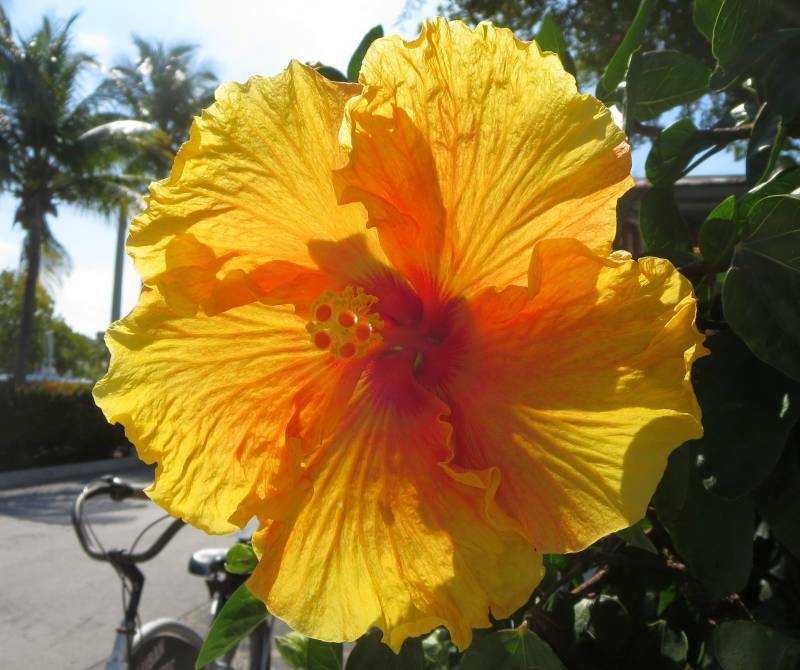 Walking along a side street in Key West, we saw a blossom on the sidewalk and picked it up. We couldn't see where it came from, there were no similar blossoms nearby still attached. It did come from a Key West plant but beyond that it's a mystery so far. Can anybody identify the blossom? 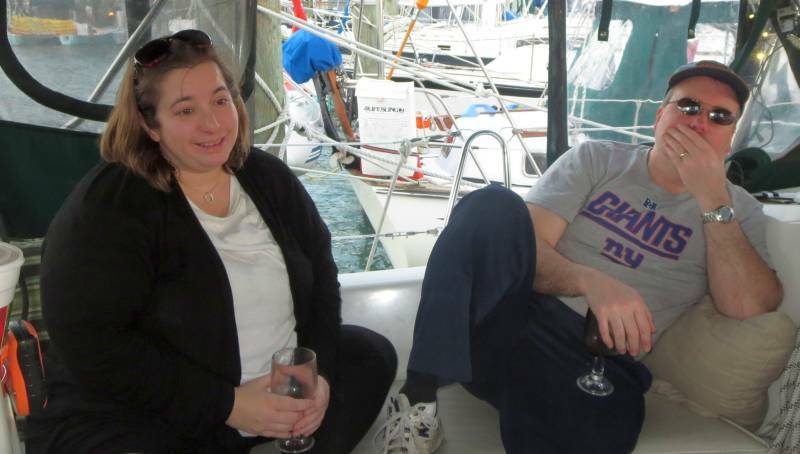 Last year we were enjoying our wine on the back of our boat when a passing boat stopped and the captain said, "I know where Lagrangeville is!" It turns out that he was from Amenia in New York, not far from Lagrangeville. After that meeting he's brought us fish several times and introduced us to tile fish which is a speciality near Key West. It's a delicious white fish good for baking or frying. Tonight we invited Harry and Paula for dinner and got to know each other better. One of the great pleasures of cruising is meeting new friends. 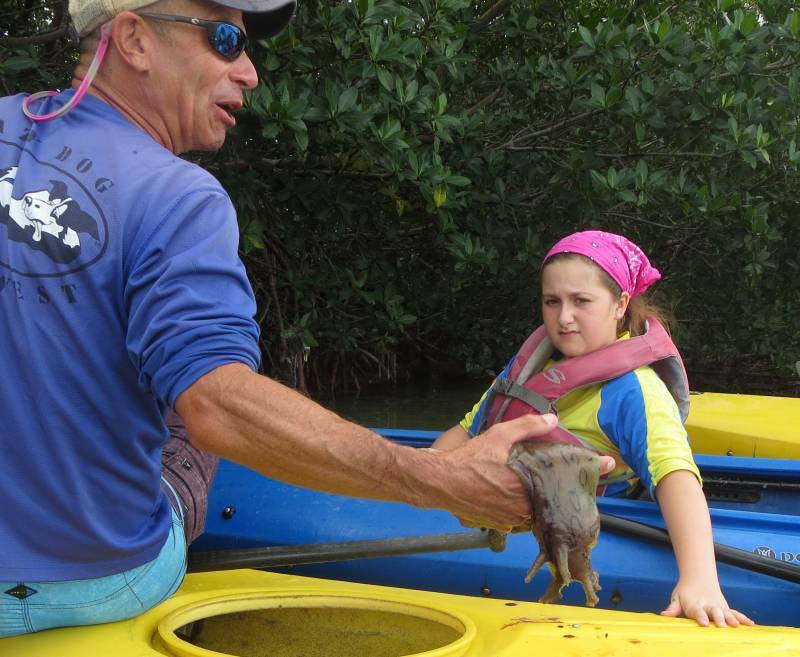 Being on the water is a common interest that brings people together, we've met many new friends while on the water. 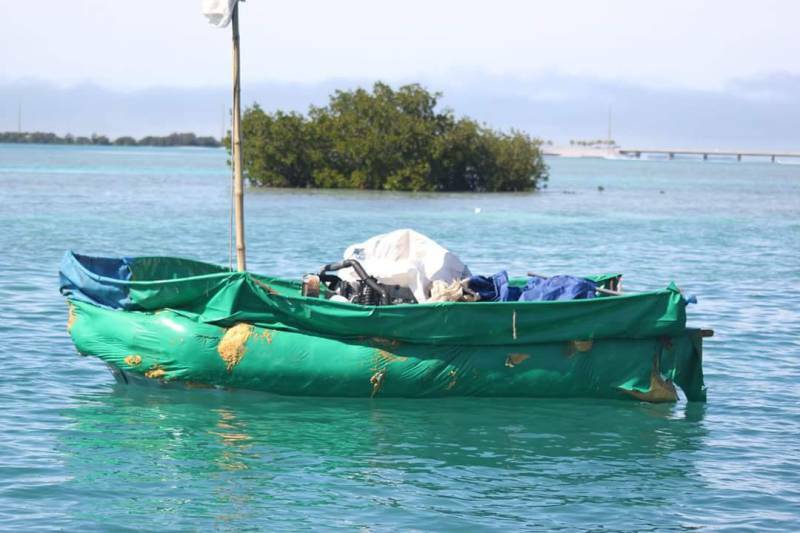 Harry was out fishing one day when he came across a Cuban Chug (what they call the boats that come from Cuba with a load of people hoping to enter the United States). They are typically patched together with anything that could float with a motor. They don't look too good and this one made the trip successfully. The occupants had left, presumably for points north. We don't see the ones that never make it across. You wouldn't want to get in the water anywhere in one of these things but there are people desperate enough to make the attempt. On Sunday I'll sign up for our second month in Key West. It's too cold to go north, we'll wait out the cold here, much better I think. At least we didn't have any fog today and the temperature was the usual (now) of a low of 70 and a high of 78. The winds have settled down now for almost a week with relatively calm winds of 5 to 10 kts. We're running the air conditioner full time for the last several days. The cockpit is fine, nice and cool but the cabin can accumulate heat and the A/C is needed. We rented a car today for $34/day from Enterprise and paid a visit to Publix for provisioning. $350 later, we're ready for another few weeks. 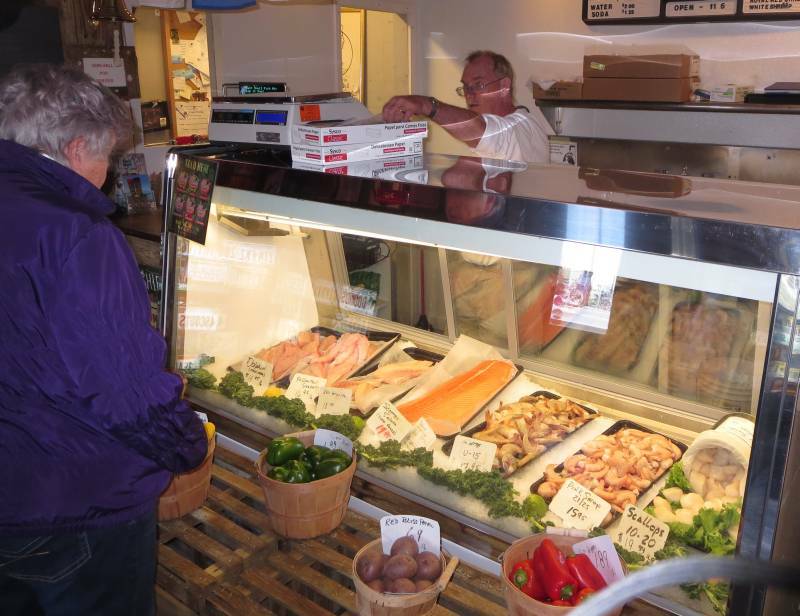 We found that it only costs about a dollar more to get fresh fish off the boat than buying frozen fish from Publix. So, fish market here we come. Part of the reason I rented a car today was for transportation to Seven Fish, a top rated restaurant on Tripadvisor for Key West. It's one of the favorite restaurants of Bill Washburn and Spencer. So we had wine at Grand Vin, a place where you can order individual glasses of fine wine and then it was off to Seven Fish. I had the tuna and I must admit it was excellent at rare. The serving size was more than enough and we all left full. I would definitely recommend the place. 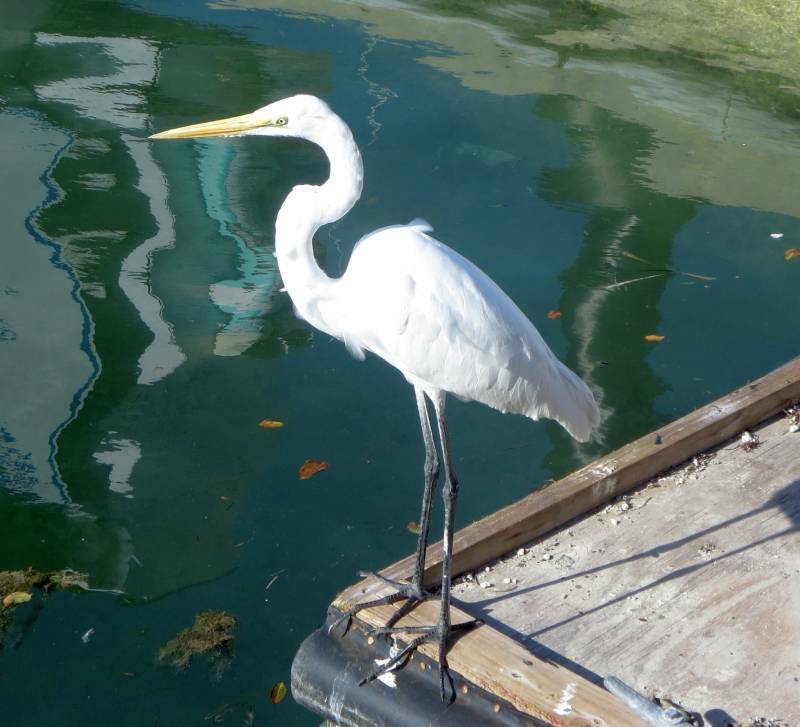 On Friday we plan on hosting friends from up north that are vacationing in Key West with a dinner, this time of chicken since they've had a steady diet of fish - however good it is, a break is needed eventually. Key West is the home of several theaters that put on plays of all types. Thinking that a lot of artists are attracted to the end of route 1, I thought it would be interesting to see what they could do. I wanted a comedy and a play from a recognized playwright so I bought tickets to Noel Coward's "Private Lives" We were first in line and got a table right in front of the stage. I found the play to be very loud. It was a small theater but the actors yelled a lot which is hard for me to understand. The acting was good but I missed many lines. 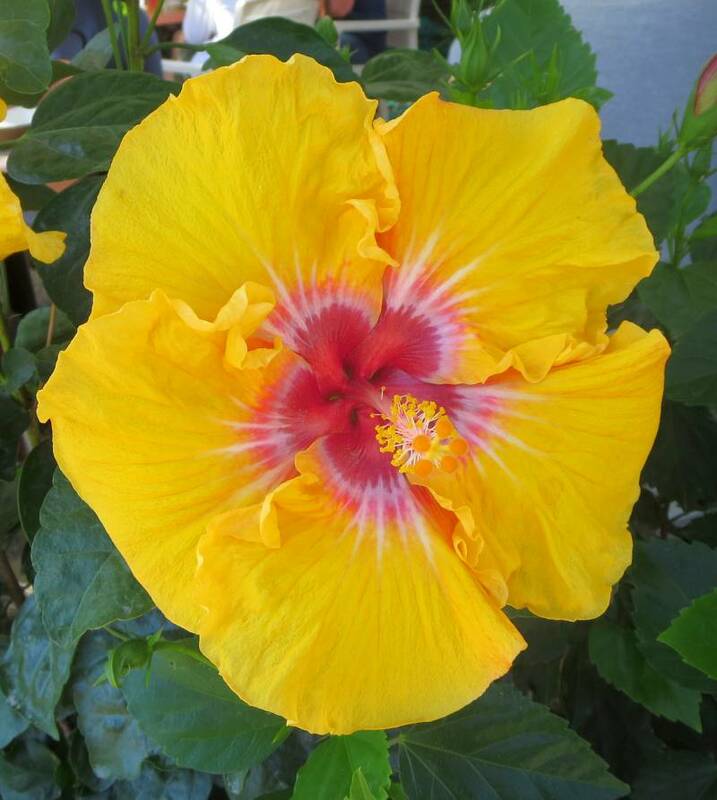 Earlier in the day I just couldn't pass up more photos of hibiscus. They are in full bloom all over Key West and I'm fascinated by the large blooms. 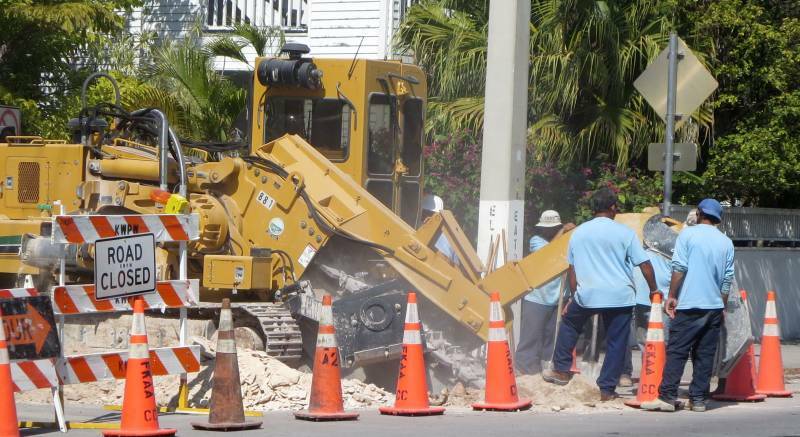 Along the way I noticed seven workmen standing around watching an automated ditch digger and thought that the machine did the work of seven men - but then those seven were just watching the machine work. It didn't seem like a real savings. We got a new neighbor, "Good Times". It's 133 ft long and you can charter it for $40,000/week, any takers? The yacht blocks the setting sun since it's between us and Mallory Square. We awoke this morning to dense fog. It's the first time in five years that we've ever seen fog in Key West. Well, we though it would certainly burn off by the time our crew arrives for a noon sail. 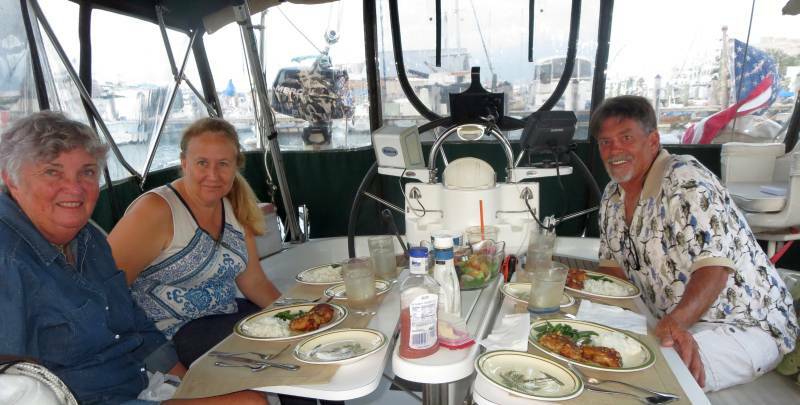 As the morning worn on, however, we had no such luck so we headed out anyway and anchored for lunch. Eventually we did get about 5 kts of wind which was just enough to get us going so we had a pleasant sail and an enjoyable time of catching up on PYC and northern news plus things about Key West we didn't know. On the way back we were passed by the Coast Guard in one of their bigger ships. We made sure we were out of the channel even though we were sailing, you don't mess with them. We are getting better returning to the slip. 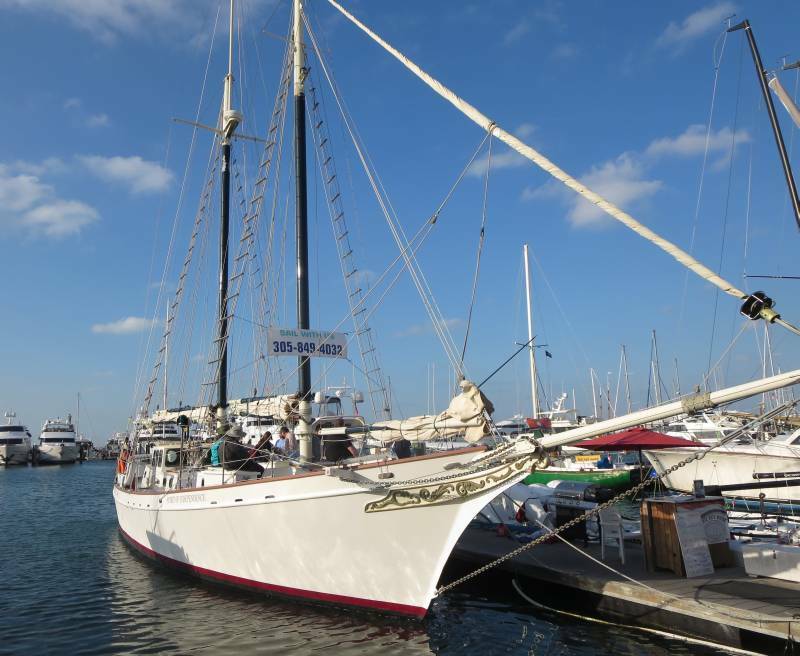 Ann did a great job of gliding into the dock and our crew of Bill Washburn and Bill Spencer looped the two side pilings to stop our forward progress while I looped the two cleats on the dock in front of us. A lot of things happening at once. We made it without a bump. We had sandwiches from the Cuban Coffee Queen for lunch so we had a light dinner. 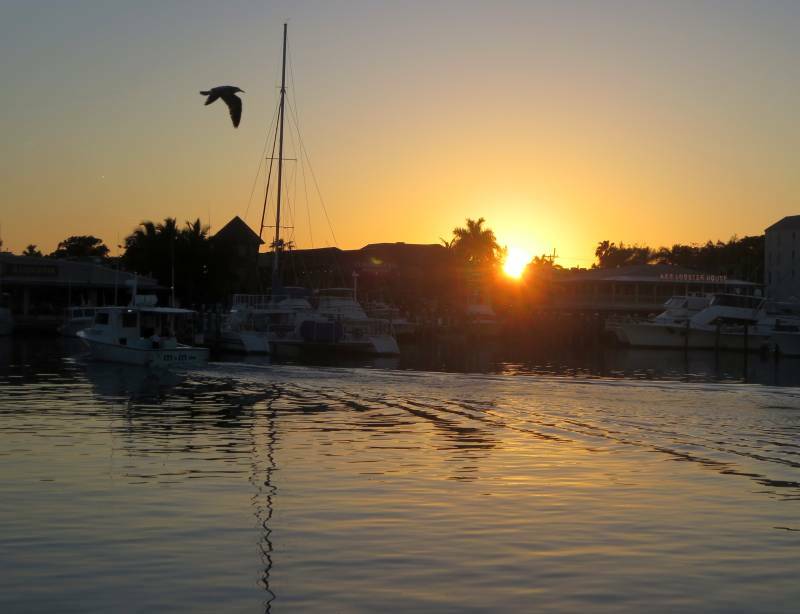 Looking ahead, the temperatures for the next week will repeat with lows of 70 and highs of 78 each day, good old fashioned Key West dependable weather in our book. I bring this up because when we looked at our webcam back up north in our house we saw an outside temperature of -11 F! That was a shock (but probably more of a shock for those still up north!. We'll try and make the best of it (the weather down here that is). 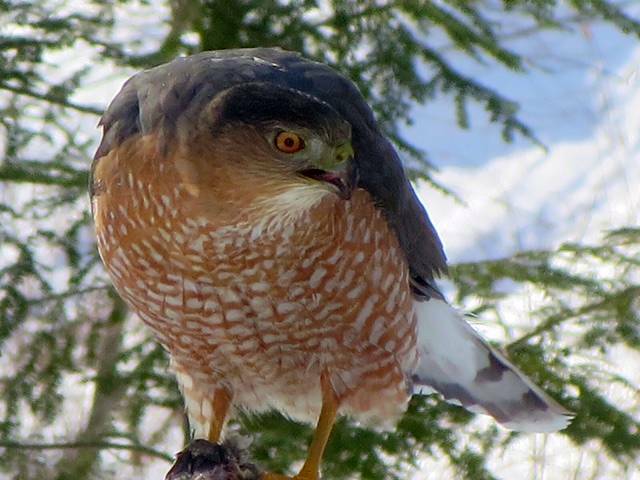 Just to remind us that beautiful creatures of snow can certainly be captured on cameras up north, here's a view of a hawk in the bird feeder of Brian McDonnell. He certainly looks fierce! 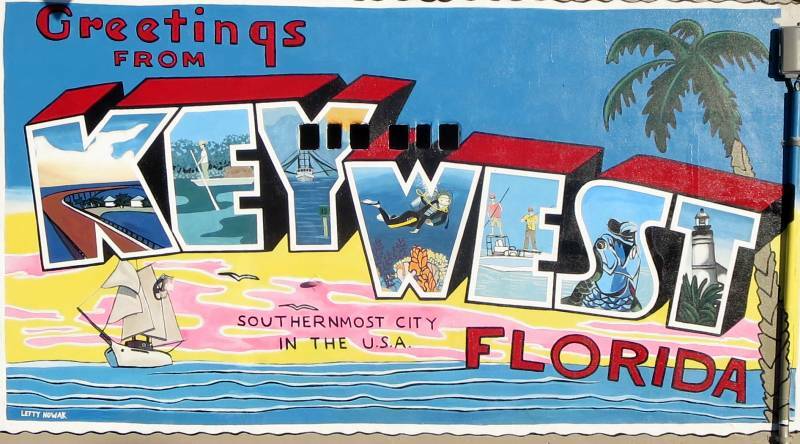 The thing about Key West is that they're not making any more of it. The land that's here now is all there is so real estate development is limited and what there is goes for very high prices (see photo). Now the condos are nice but they are just condos, typically 2 bedrooms with 2 baths. There's nothing like Miami type hotels on site. The tallest buildings are only three stories high with most being one story so even the rooms go for a good price ($450/night for a good hotel). 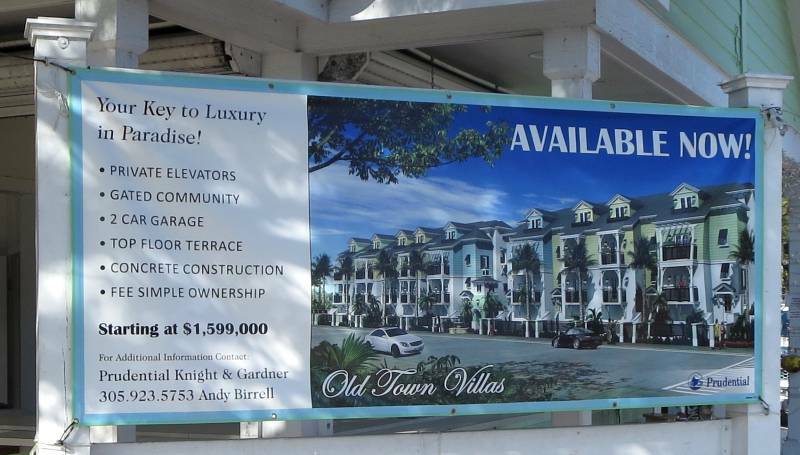 Taking that in the context of bring a boat to Key West, the $2000/month we pay for dockage sounds high but much less expensive than renting a room or buying a condo. Of course if we were satisfied with wintering over in Titusville we could have gotten by with $450/month but we do like Key West. You could always winter over on a mooring in Marathon but even that is $300/month and then you have just Marathon and you have to run the genset twice a day. 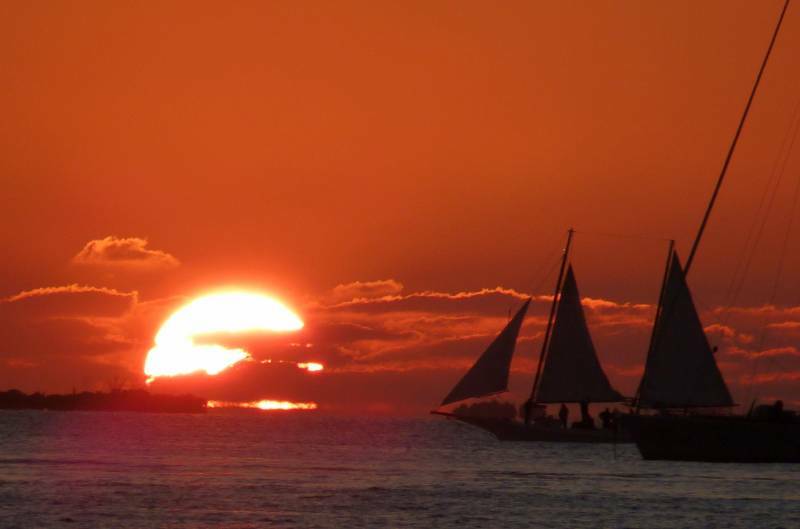 I'd rather be in Key West. We have easy access to shore and we've never done as much exercise as here, getting out for runs and walks three times a day. 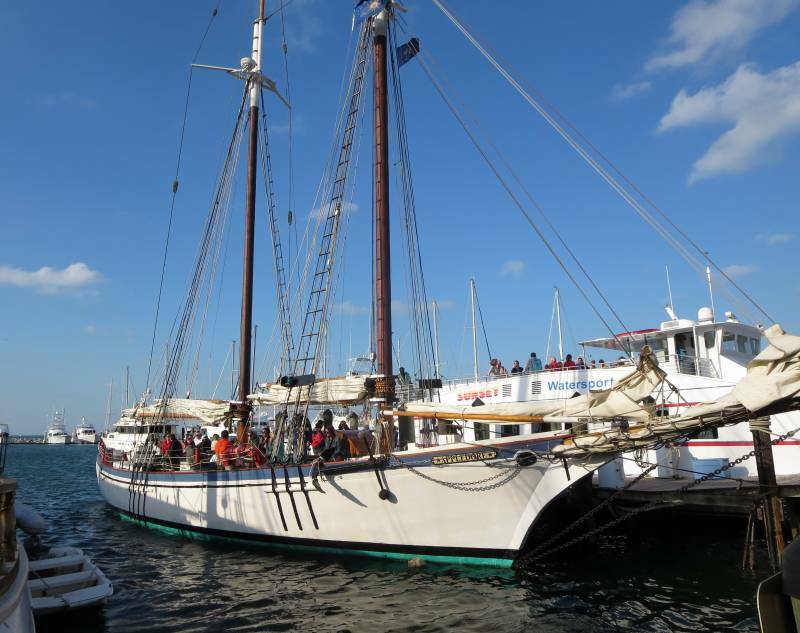 Of course, Key West is a popular place and can be crowded when the tour boats come in. There were two yesterday and another one today. We walked to Sloppy Joe's with the intention of getting a table and listening to Barry Cuda bang away at his piano which we greatly enjoy. However, the tour boat people beat us there and the place was very noisy so we skipped by. Still, we had a nice walk in the perfect 77 degree weather with full sun. 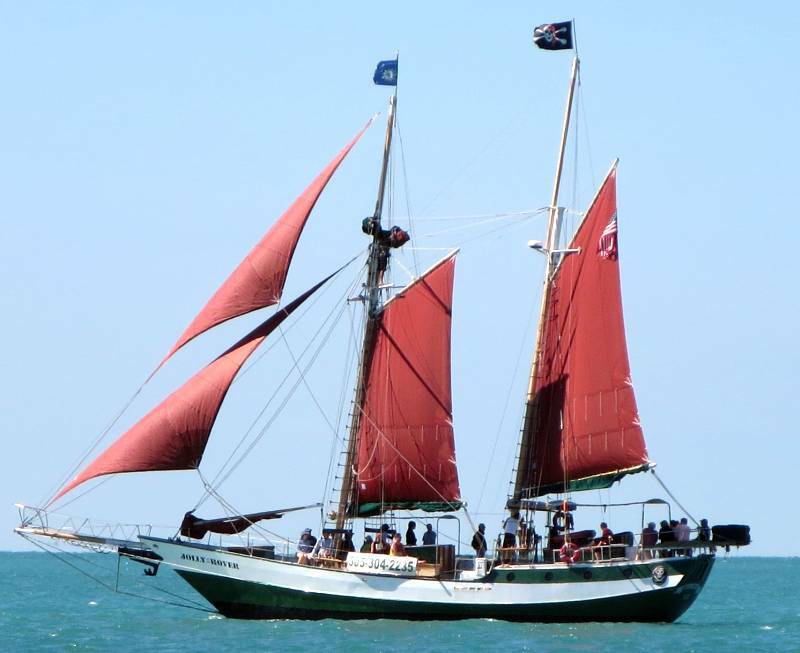 On Tuesday we'll go for a sail and anchor for lunch with guests. It'll be fun. Two ships today - crowds! 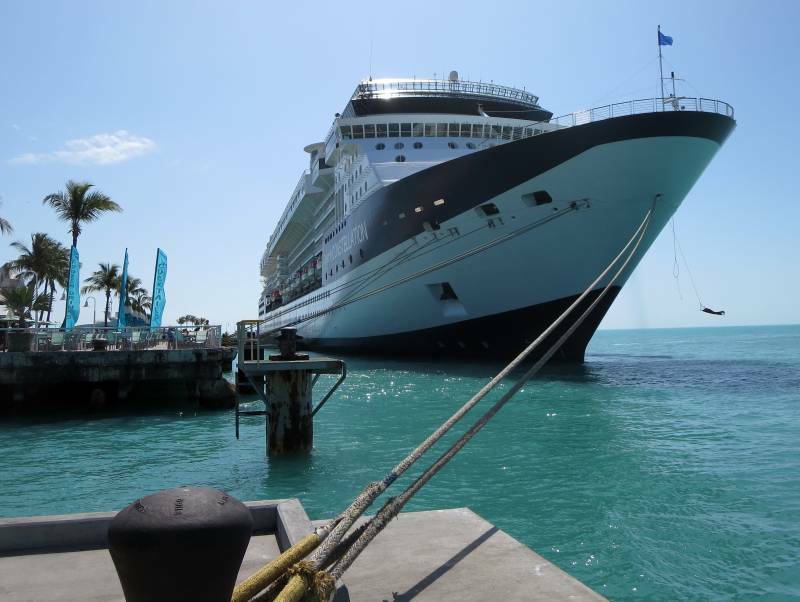 Key West has three cruise ships docks and today two were occupied. Now Key West is basically a small town, less than 1 mile square with more of the shops within a three block area. Once you leave Duval Street, it's mostly residential. So when two huge cruise ships dock, the town is flooded with people. They don't eat at the restaurants since meals are provided with their cruise ship ticket but they occupy all the tourist spots. The streets are filled with sightseeing trolleys and trains along with lots of rented bicycles and scooters. With all that we mostly stayed near our boat and enjoyed the warm breezes. Key West has reentered summertime. It's been rather cool up to now but the temperatures now hit a low of 70 and a high of 78, perfect for Key West. 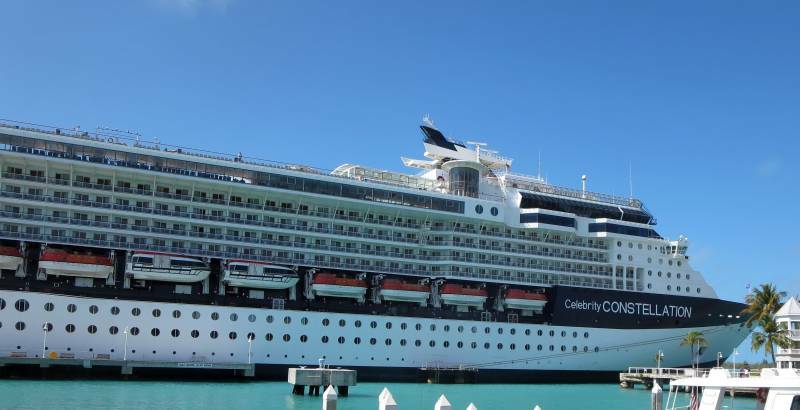 These cruise ships are just huge! You have to see them in person to appreciate how big they are! Key West attracts the artistically inclined so we're going to see a play on Wednesday put on by the locals. 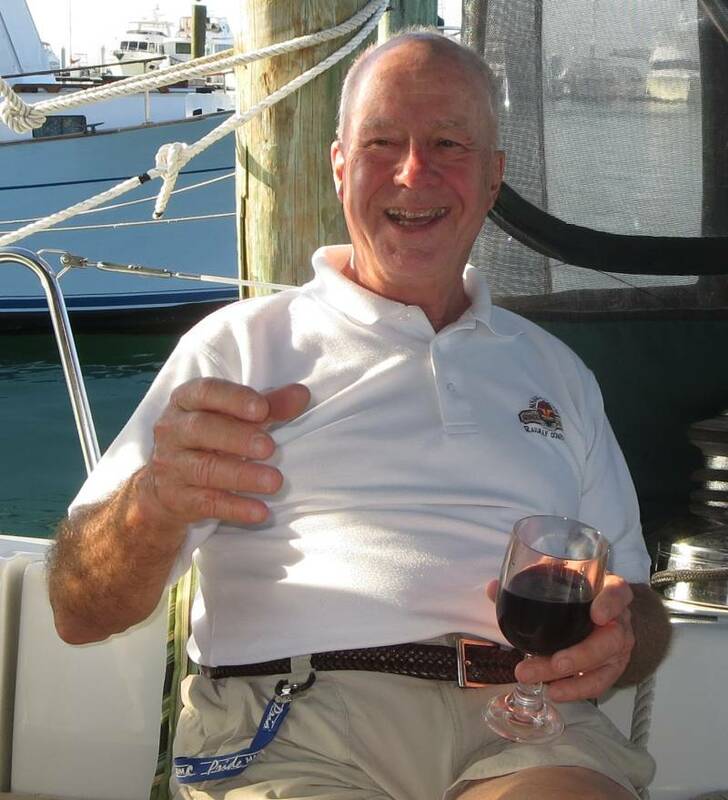 We've invited Bill Spencer and Bill Washburn out for a day of sailing on Tuesday and on Thursday we still have the Seven Fish restaurant planned. Tomorrow, on Monday, we plan on spending time at Sloppy Joe's in the afternoon to listen to Barry Cuda play his piano. He's one of our favorite entertainers. So we have a full schedule and plan to extend that through March until we leave March 28th. Great fun being down in the warm weather. Once a year Key West holds an art festival downtown. Exhibitors come from all over, some from as far away at Washington (the state, not D.C.) We look forward to it every year and it was held today. The vendors display watercolors, acrylics, pastels, sculptures, photos heavily retouched with Photoshop, jewelry and more. It's great fun just walking along and looking at all the different styles. Ann, of course, will strike up a conversation with anyone, especially other artists. Unfortunately, you're not allowed to take photos of their work so I don't have many pictures. We are still in recovery mode (or withdrawal) from the wonderful visits from our kids so we didn't do too much other than the walk to the art festival. 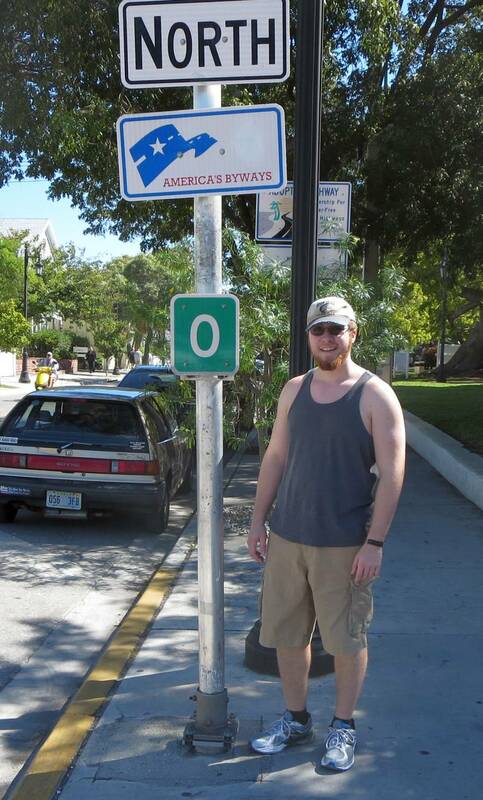 Part of the fun of Key West is just walking around in the afternoon which we do a lot of. We recently bought Fitbits for the two of us to track our activity level and we've found that we're getting much more exercise than when we were up north. We still go our morning runs or walks but we also get out in the afternoon which we never did in New York, especially when it turned cold (below 60, ha). We have reservations to eat at the Seven Fish restaurant on Thursday with Bill Spencer and Bill Washburn. It's reputed to be the best seafood restaurant in Key West, we're looking forward to it. Today was the last of the cold, windy days according to the weatherman. Of course, his track record hasn't been too good recently but we're hopeful. 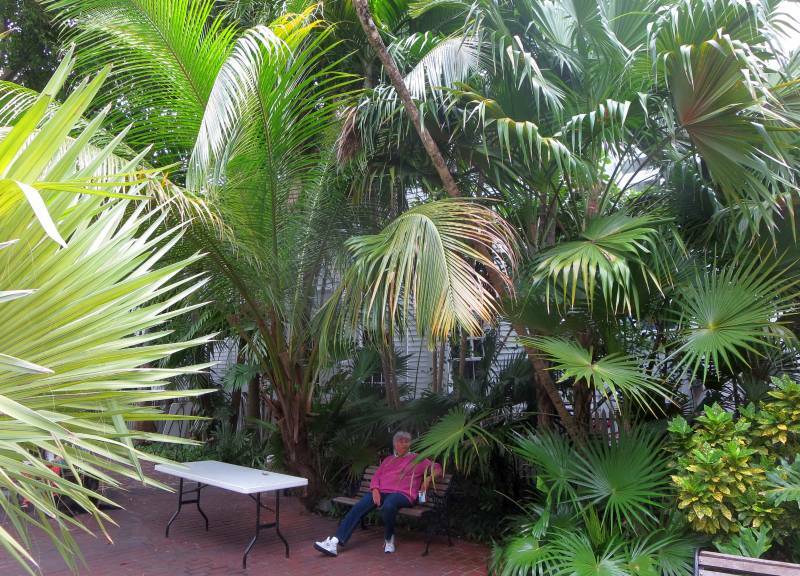 One thing Key West has are temperatures that never reach freezing (it's surrounded by lots of water) and that results in tropical plantings. I don't know if everything is in bloom but there's lots of color when you walk down a city street. 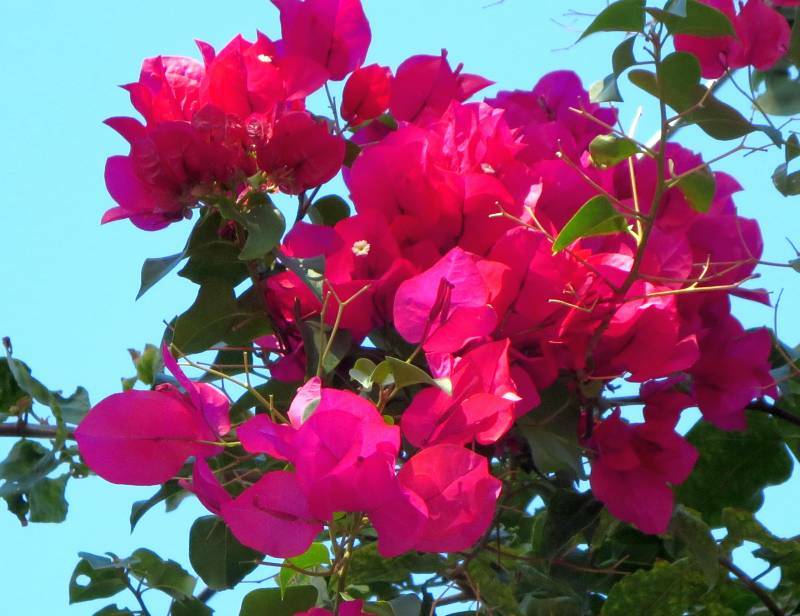 Bougainvillea is a popular planting, you will pass it by on almost any street in town. I took Hoolie out for his evening walk and stopped by Barry Cuda who was holding forth at BO's Fishwagon and then dropped by Schooner Wharf to listen to the Paul Cotton Band for awhile. I like both of the musicians, a great thing about Key West. 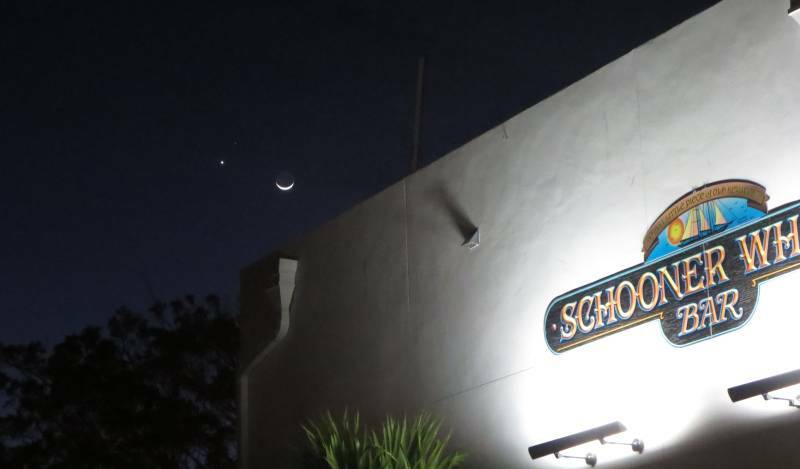 Along the way I noticed the setting moon that was accompanied closely by Venus and Mars, quite a sight! 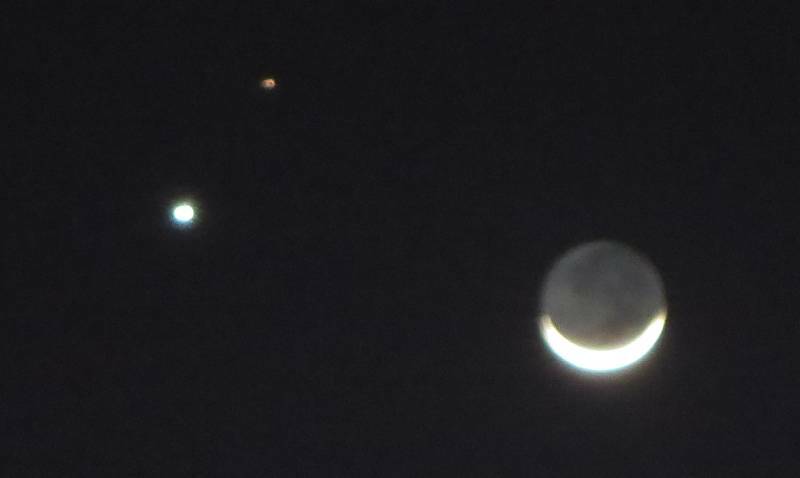 It's a very rare event that includes all three in such a tight group in the sky. 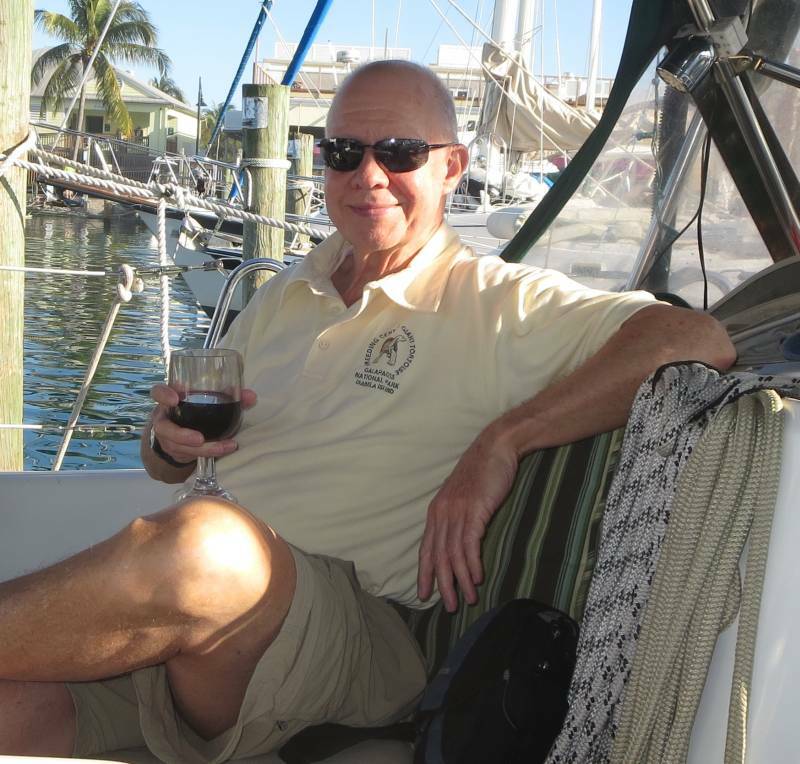 Bill Spence and Bill Washburn are in Key West for the next two weeks and we've made reservations at Seven Fishes for Thursday night, a meeting of PYC South! There was never a time we were more grateful to be at a marina than last night. The winds averaged 30 kts with gusts to 40 kts! We have two piers and several rows of boats between us and the entrance so it wasn't so bad but it's nice to be safe and secure in such winds. The boats out at anchor had no such protection and we found out this morning that six boats broke free and dragged to shore. Whatever the strength of the wind is at 20 kts, it's four times that at 40 kt, it's another whole ballgame. The winds did not abate during the day, averaging 20 to 30 kts all day long (we had another gust to 35 kts). On top of that, the high today was only 60F. Now you have to appreciate that the locals are not used to any temperatures below 70 and to them it's freezing and they dress appropriately (in their opinion). Down filled parkas are not uncommon, long pants are the norm, hoodies with the hood pulled tightly over their heads is seen everywhere. With that we did boat chores (filled water tank, pump out, laundry, dewater the dinghy, adjust lines to keep off the dock, etc.) We did get out for a walk and we stopped by the local fish market to buy dinner, a pound of mahi-mahi which Ann prepared after wine on the back of the boat (with our ceramic heater going full blast in the cockpit). It is definitely cooler than last year but still comfortable. It's due to warm up starting Saturday with the winds dying off to more like a normal 10 to 15 kts. The snow back home is just amazing, we look every morning on our webcam. I read an article today that predicted the winters we've had the last two years is the new normal due to global warming. Of course, everything bad seems to be blamed on global warming whether it's too hot or too cold or too wet or too dry. Time will tell. Great fish market about 500 ft from our boat. 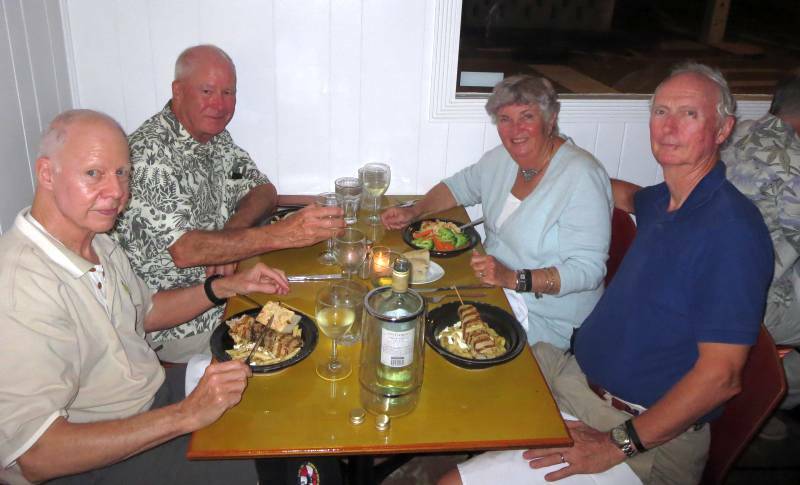 Meanwhile, we had a fine mahi-mahi dinner. There is no blog tonight from Sarah, she left this morning at 5:00 am with her family for Connecticut. We just heard from up north that they all made the trip safely except for one of 8 bags which the airline lost. Hoolie was sad to see his playmate of the last two months leave as we were. We've had a wonderful time, what more could you want than to spend time with your kids and grandkids. Time for catching up on reading and the boat chores we can do inside. In boating the weather is king, just have to ride it out. Things are predicted to return to normal on Saturday. Today I was a sleepy head so I missed my walk but I got to snuggle with my mom. We had yummy eggs for breakfast. Then I helped Matt washing the deck then we saw Lucky the manatee and then a big boat came in named Sarahbeth and that is one of my nick names. Then we saw Lucky a lot better this time and she was so cute. Then we went to the Lazy Dog kayaking and we saw sea cucumber, upside down jellyfish, a batfish, nurse shark, and seastar ( starfish). It was awesome this time I went with Daddy and we finished first I know it is not a race but it is just so much fun. Then we got ready to go out for dinner I had a BQQ chicken with beans and yellow rice. It was so good that I was so stuffed! Then we went back to the boat. Now I just want to say that I am very happy that Nana and Grandpa let me go on this once and a life time experience. I had a lot of fun and coconuts so Thank you very much with love. Well bye off to say bye to the island bye. Today was the last good weather day for several days. The intense cold front that's battering the northeast will even reach Key West enough to depress the high for Wednesday down to 68. You'll see the locals all dressed out in down filled parkas, long pants and wool hats. To be fair, it's cooler in the morning with 20 to 30 mph winds predicted. A batfish - odd looking! So today we took advantage of the 74 high and went kayaking at Lazy Dog. We asked for the same guide we had last week and we was good at finding all the sea critters in the shallows. 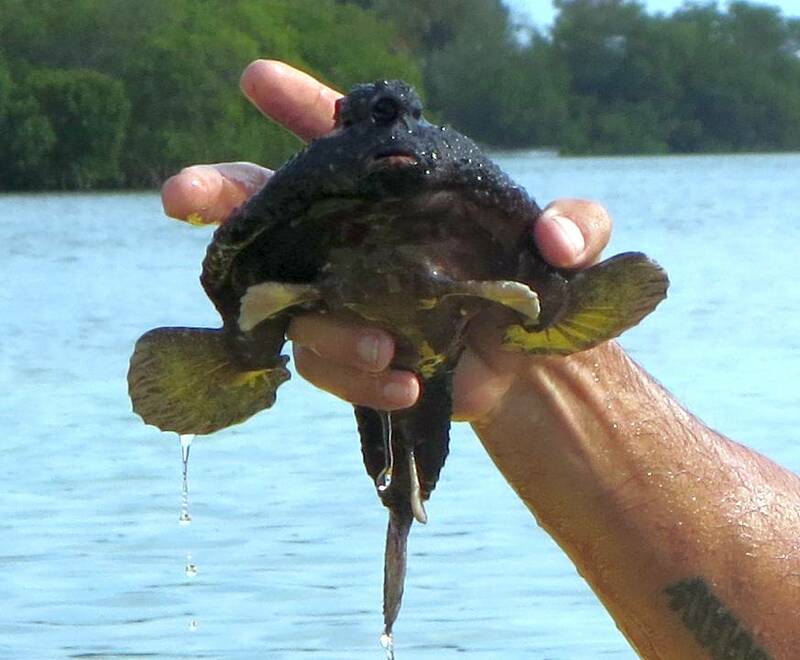 He even found a batfish, a rarity (about once a season it's found by the guides). In all a grand time. 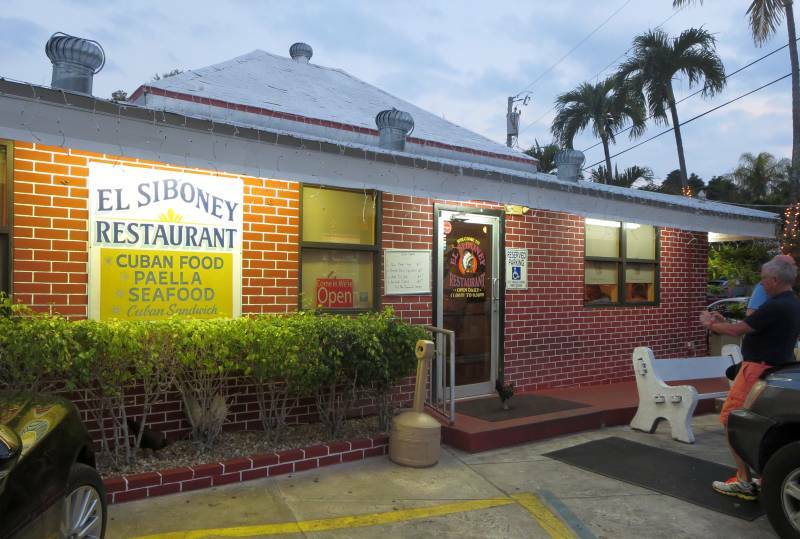 Lastly we headed for the same Cuban restaurant that Mike and Carrie enjoyed last week. It looks like a hole in the wall but it expands out into lots of tables in back. The food is good and reasonably priced with entrees in the $12 range. Now everybody is sad, especially the two girls. It was a wonderful vacation and Sarah is leaving us after two mondths of home schooling. She's already asked for a reservation for next year! We'll take tomorrow off and besides, the weather will be cold and windy anyway. -15 at home, 74 here - where would you rather be? Today I woke up and we did our walk. Then we had left over donuts for breakfast and then watched TV. We also played with our stuff animals then got ready for the beach. It was nice on our walk this morning but it started to get very windy. 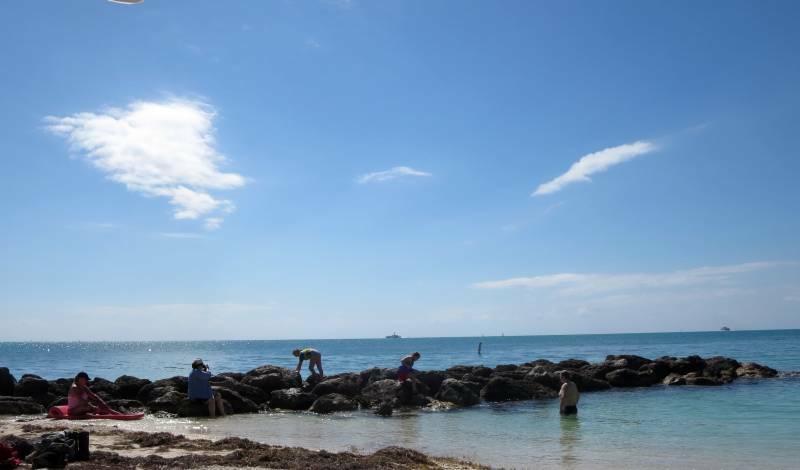 When we arrived at the beach we had lunch at the little shack first then went to Fort Zachary Taylor state park and we saw big cannons and went up to the very top. 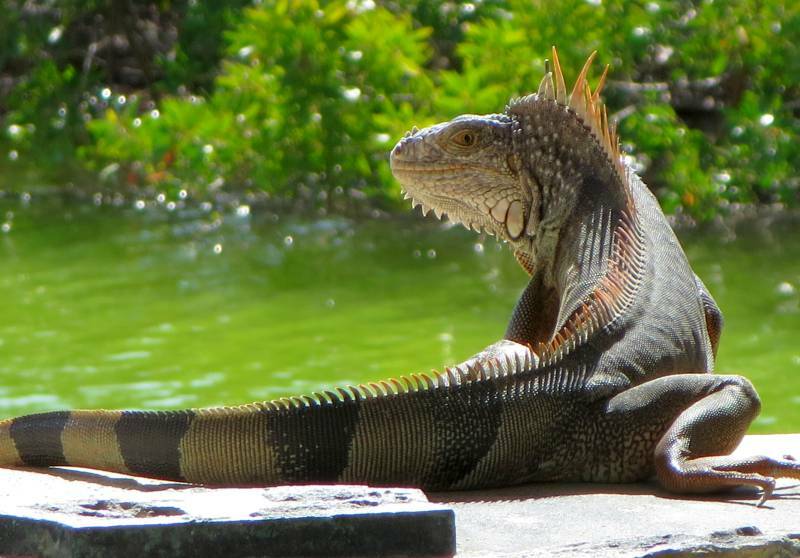 We also saw two iguanas one in the widow at the fort and the over in the bushes and ran away when we walked past. It was very pretty to see the ocean so high up on the fort. Then we went to the beach and the water was very cold so I started making a fort out of sand. Then I went in the water with my sister and we pretended to be boogie boards riding with the waves. Then Natalie made a pool and I made a big mountain. Then we went to climb on the rocks but the waves were so big they crashed on us. Then got back in the water. Well bye off to get dry bye. I was startled this morning when I loaded the weather from Lagrangeville, it was -15 F!! That was a real wake up call for us, such cold weather!! With the high winds, the wind chill was predicted to reach -50! That is just too cold! I quickly checked the temperature in the house and it was at 59 (our set temperature is at 60). I looked at our furnace cam and it was showing the furnace operating as normal, thank goodness. I also have the house temperature monitored as part of our house alarm package so I'll get a call any time of the day or night if the house temperature drops below 50F. So far, so good. Having absorbed that news, we all decided a day at the beach was in order. The high for the day was to be 74 but there were winds of 15 to 20 kts, a little chilly if you stood directly in the wind. Nevertheless, we managed to keep warm by staying in the full sun. A tour of the fort was next with an iguana caught in one of the windows. Tuesday is the last day of Philip and Monique's visit and we have the kayak tour scheduled with the night our at the Cuban restaurant that Mike and Carrie liked so much. Today we had donuts for breakfast! 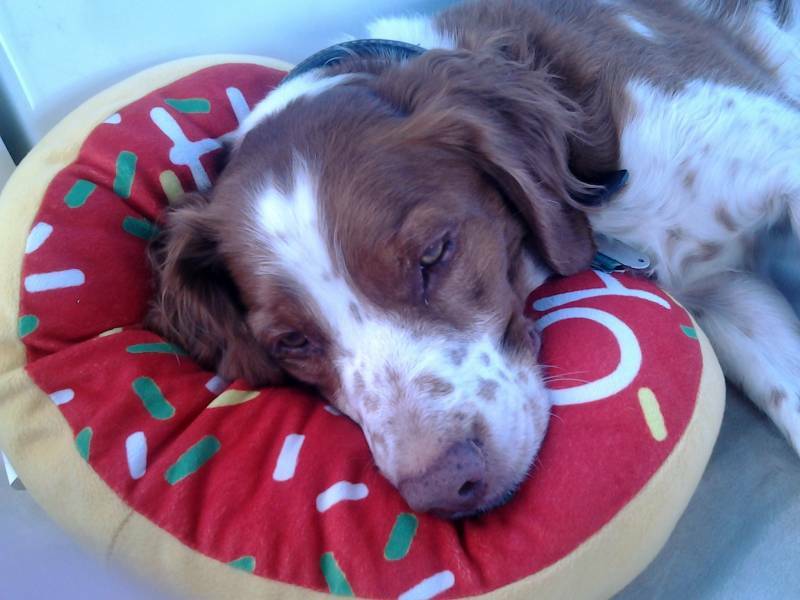 I love donuts, we have them every Sunday. Then we got ready to sail. Today was the perfect day for sailing and we had to get every thing that could fall down. It was good that we did because we were so sideways then the doors opened and it was hard to go to the bathroom. It was not as crazy wavy as it was with my cousins. 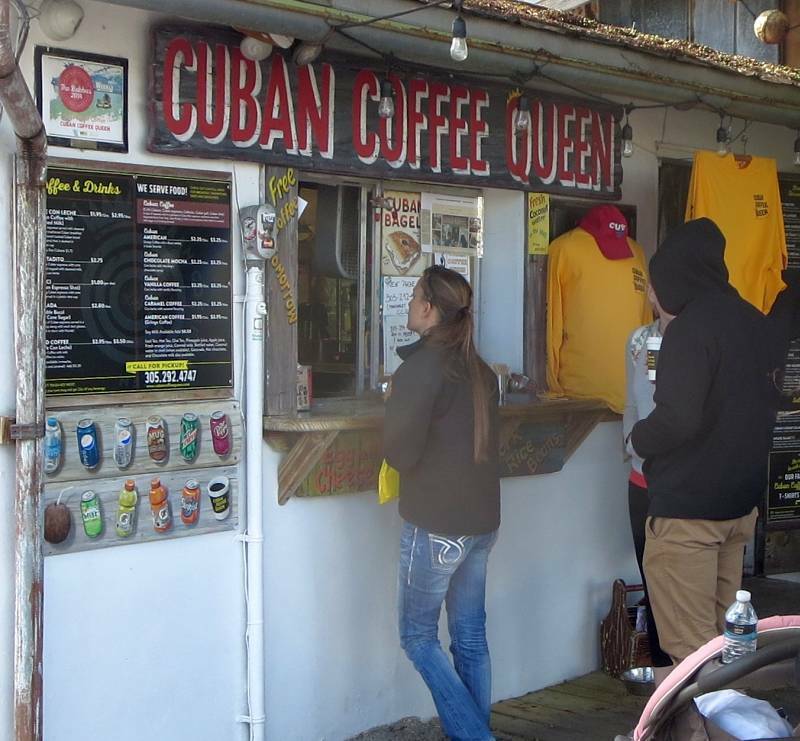 We anchored oiHbbthen had Cuban Queen sandwiches which was pork, and ham &cheese. It was so good, then I had a donut for dessert. Then we went to sail again and I steered the boat too, for a good ways. Then we came back and went to Mallory Square. There were a lot of people there like always. My mom sat to save a spot for the sunset and take a rest. We saw a guy who was singing and playing a instrument. You probably would just walk by. But he had a dog that if you hand out a dollar by the dog, it would take the money and put it in the bucket when the owner was singing. He probably got 10 dollars a minute, and the dog had pants on too! I thought that was really cool and want to teach my dog that too. Then I took some shots of the sunset and then we went back to the boat. When we came back Nana had a yummy dinner waiting for us. Then I had a cookie bye. I had picked Sunday as the best day for a sail with the predicted winds of 10 to 15 kts and calm seas. The high for the day was only 70 but with the full sun out the cockpit was very warm. Leaving the dock we once again had to carefully count lines and remember to untie the dinghy which was locked to the boat for security. Eight lines plus three utility lines later, we were free. Ann backed out while we unlooped the aft lines form the two pilings. The two lines on either side were key to stopping us upon our return so we wouldn't bang into the dock with our anchor. Out into the channel we headed for our usual anchorage behind Sunset Key with sandwiches from Cuban Coffee Queen. Off again we headed for the barrier reefs but turned back before reaching the deep blue waters of the gulf stream. One could not have scripted a better day for sailing. No one got seasick for one thing. After a successful landing, Philip and Monique and the kids went to Mallory Square to watch the sunset. 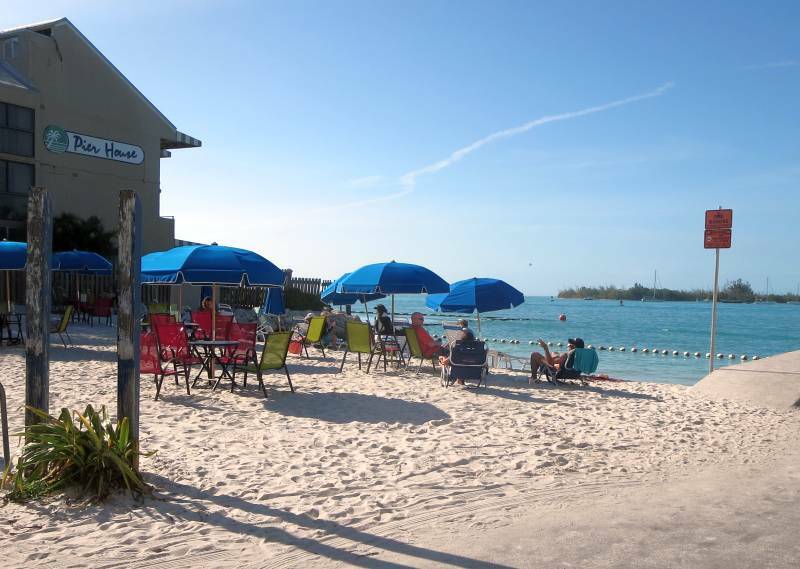 On Monday we'll do one last visit to the beach at Ft Zachary Taylor, an all day event which the kids enjoy no end. With a predicted high of 74, it ought to be great. 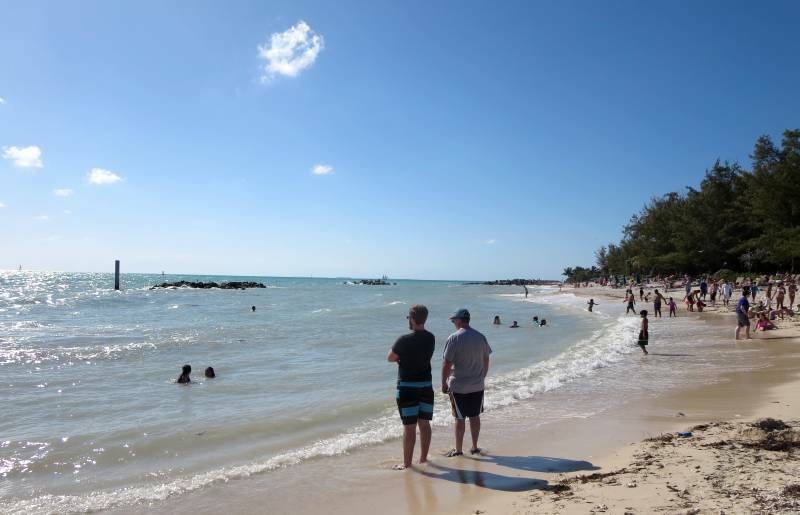 The high today was only 64, downright chilly for Key West. We will be in a warming trend the next few days. Still, with the enclosure and the full sun, the cockpit was warm. Today was shopping day for the kids, Ann and Monique while the rest of us went sightseeing. 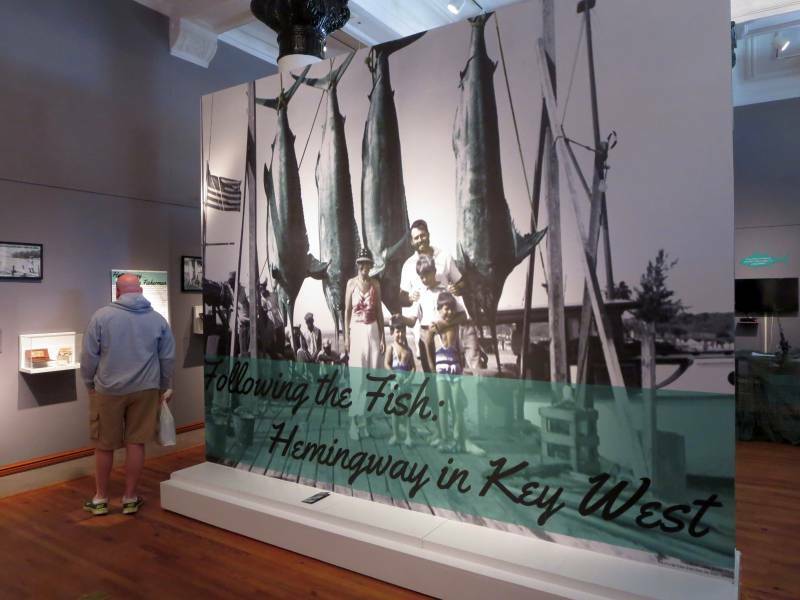 The first stop was the Key West Museum of Art and History, pretty much everything you could ever want to know about Key West. The most famous resident was Ernst Hemingway and the museum covered his life and times along with events of the Civil War. Key West was always in the hands of the north during the Civil War since they occupied the fort which was essentially impregnable during that period of time. Next on the walking tour was the Little White House used by Harry S. Truman during his presidency. One thing I learned was that in a poll conducted among noted historians, Truman came out rated 5th best of all the presidents. The presidents rated ahead of him were Lincoln, Washington and the two Roosevelts. 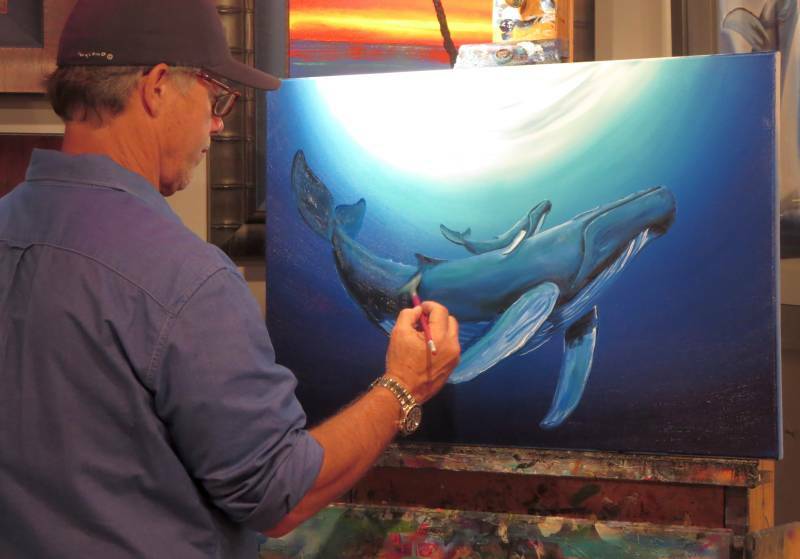 Lastly, we attended a painting demonstration by Robert Wyland (known simply as "Wyland"). He started an oil painting from scratch and we watched him complete his work. The guy next to me was recording him on video the entire time which I thought was rather odd since most painters don't want photos of their work taken. However, I then found out that the gentleman had already purchased the painting to be finished in the evening demonstration. The cost of the painting was $9000. That's a little (a lot!) outside my range but Ann immensely enjoyed seeing Wyland paint. On Sunday we're going out for a sail, it's supposed to be 70. Today I was a sleepy head so I didn't walk. Then when I was still in my bed I got my work over with and finished it just when I woke up. Then I wrote in my dairy a good page. Then we went on a walk to have lunch at B.O. 's Fishwagon. It was very good I had Keylimeade and chicken with rice and beans on the side. We saw a lot of chickens and the person we met on the beach yesterday getting lunch too. Then we went back and I played on my tablet then Matt and I played a game called magic. He just showed me to play and tomorrow we're going to do the champion ships. He taught my sister how to play too. I won only once out of four. My sister won two times out of two. So it is pretty exciting to see who wins. Then we helped Nana get the food and sort it where it has to go then watched TV for a while. We had Chili tonight which was awesome then I had two cookies. It is also very nice and warm here in Key West. Well bye off to put away the dishes bye. Today was resupply day (we have a lot of heavy eaters on board). Although there are no Walmarts in Key West or for that matter anywhere in the Keys, there are Publix supermarkets which are fine even though they are a little more expensive. 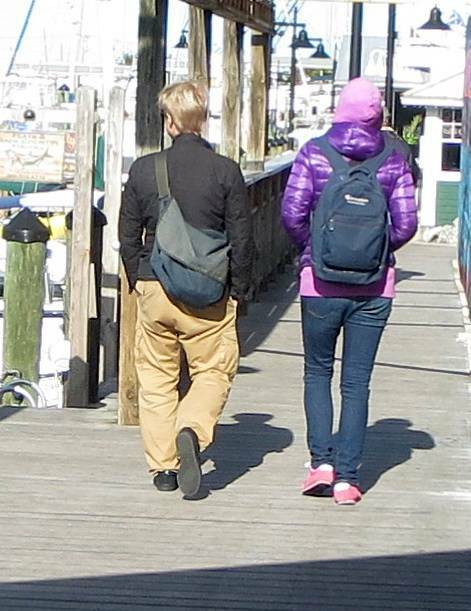 Walking through the marina you are struck by all the ways to enjoy the nearby ocean. There are legions of day fishing boats, party boats that go out three times a day, charter boats the same size as us and then there are the schooners.They dock at, you guessed it, Schooner Wharf about 100 ft away.They all have something unique to offer and this year they seem to be busier than I ever remember the last four years. 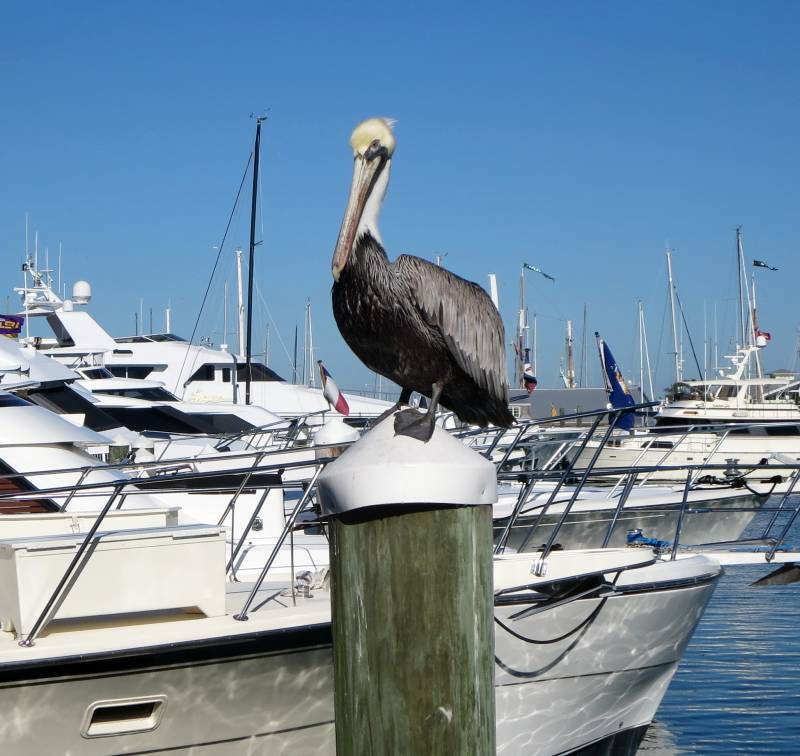 Key West offers a lot of way to spend your money. The crew this week is just enjoying the warm weather, encouraged by the below zero temperatures back home, unreal! We never thought there would be two winters in a row like this in the northeast. We'll try to make the best of it down here. What better way to spend February 12? Today we started with a walk and saw mostly stuff we know and I was a sleepy head this morning. Then I did my work and we headed for the beach, the water was cold, but you got used to it. We built sand forts, sand castles, and sand cakes. We also went on the rocks and I saw fish. It was a lot of fun because we raced across the rocks. We even saw a pelican on the rock and we named it Steve. It was so close that I could of pet it. It was a brown pelican too. We met a girl and spent the whole day with her too. We played Marco Polo and I won a lot and they did too. We also made a shop to buy food and I was the chef and we made a table. I had to make a wall to block my kitchen from water. We did that because all the food was sand so if it got wet it would be more like a smoothie. Then we left and went back to the boat to take showers. Were having pizza tonight that is very yummy. Well bye off to wait for the pizza bye. With no wind (for a change) and full sun it was a perfect beach day even though the high was only predicted to be 71. 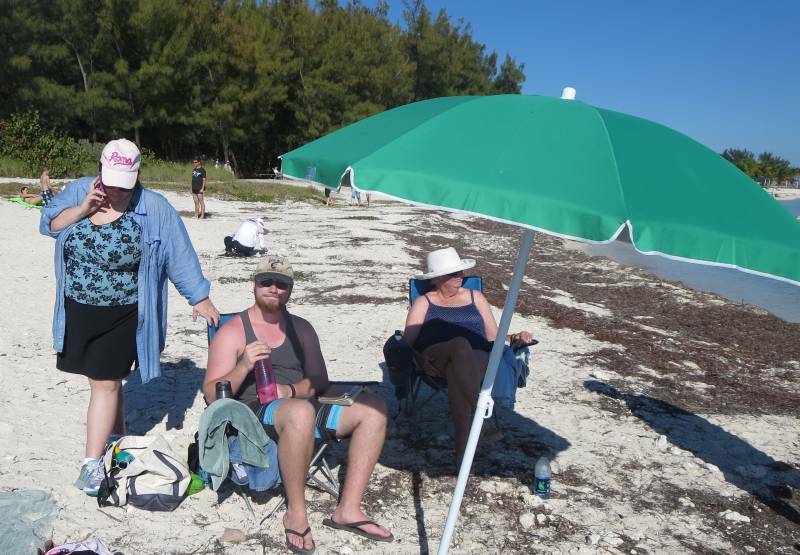 So we headed off around noon and spent the day by the waters of Hawk Channel at Ft Zachary Taylor beach. It's one of our favorite places since it has a protective arm of breaker rocks that keep out the waves. The kids can play in the shadow of the breakwater in safety and if they want more wave action, they can move further west. Rather be here than at home in New York! The kids never seem to tire of playing in the water and in building in the sand. I did access our webcams at our house in Lagrangeville, NY and saw that our driveway was once again covered with snow and require plowing out yet another time (4 times so far!!). It's depressing in a way to see all the snow at home and yet not depressing to find ourselves not there! I'll take Key West in the wintertime! Today I went on a walk then played on my tablet. Then just Daddy and I went on a walk and he got his Cuban Coffee and he got me a strawberry smoothie and went to the shell warehouse and saw some stuff. Then we went back to the boat for breakfast. For breakfast I had grapefruit and I put too much sugar, it was very sweet. After that Natalie and I read up on the deck in the nice warm sun. Then we went on a walk and Natalie and I got sunglass then we moved on and got pretzels and lemonade yum! We looked at a store with all hand made stuff that is super cool. We saw a guy feed the pelicans and I got great pictures of them too. I went and saw big fish. We fed the fish and it was hard to see with all the sea grass. For lunch I was the chef and made 4 egg sandwiches and 1 ham and cheese sandwich. It was so good and I was so tired to. Well bye off to take more pictures bye. The next crew arrive around 5:30 or so and everybody settled in for the night. They had a long day with their departure in the early morning hours from Hartford, CT, arrival at Ft Lauderdale and then the long drive to Key West. They had to take a room at a motel the night before to avoid delays from the most recent winter storm of the northeast, some winter!! However, 70 degree weather fixes a lot of things. The sun was out full and the breezes were warm, what a difference! The rest of the next day (Wednesday) was devoted to not doing too much, just resting up and enjoying the warm weather. 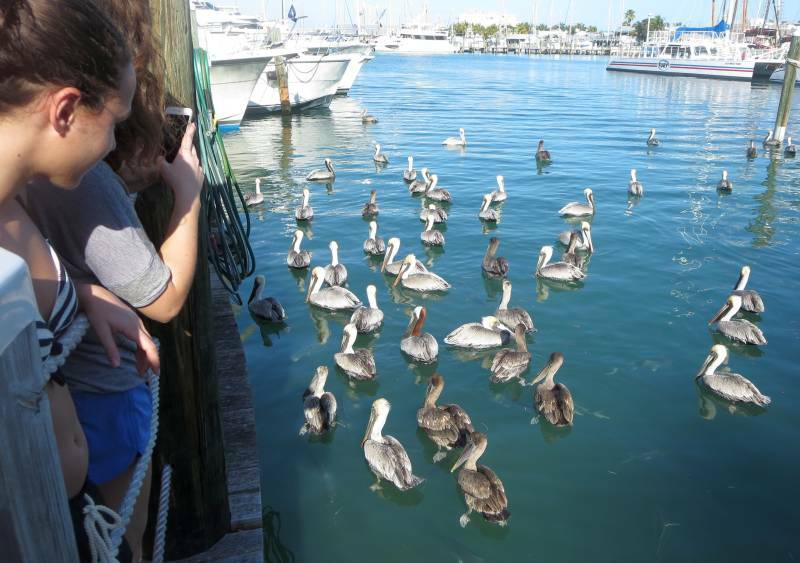 Finally, everyone was moved for a walk along the boardwalk by the harbor and to see the pelican and tarpon feeding at 4:00 pm followed by Ann's cooking in Fleetwing. On Thursday I think we're headed for the beach at Ft Zachary Taylor. We all said our goodbyes this morning to Mike, Carrie, Finn and Rowan. It was a sad goodbye but we all had a great time. They headed north to Miami for their flight back to Pennsylvania while we swung into action to get the boat ready for the next shift. We filled up four commercial sized washers, no small feat. After cleaning the cabin and a few other sundry jobs, we were ready for the second shift. Philip and Monique and family flew to Ft Lauderdale and rented a minivan for the drive south. They arrived around 5:30 and the second party started! We thought it was a little cool at 74 with a 18 kt breeze but they were all in shirt sleeves. I think they are going to chill out for a few days before tackling what Key West has to offer besides warmer weather. We'll see how things progress. We awoke to a forecast for thunderstorms all day and it was already raining! This did not bode well for our 10:00 appointment for kayaking at Lazy Dog. However, the skies cleared by 9:00 and we all voted to give it a try. Getting to Lazy Dog, we were all fitted with life vests (even though the water was only knee deep) and given a pep talk on how to paddle. We found the way out to be challenging with both the tide and wind against us! 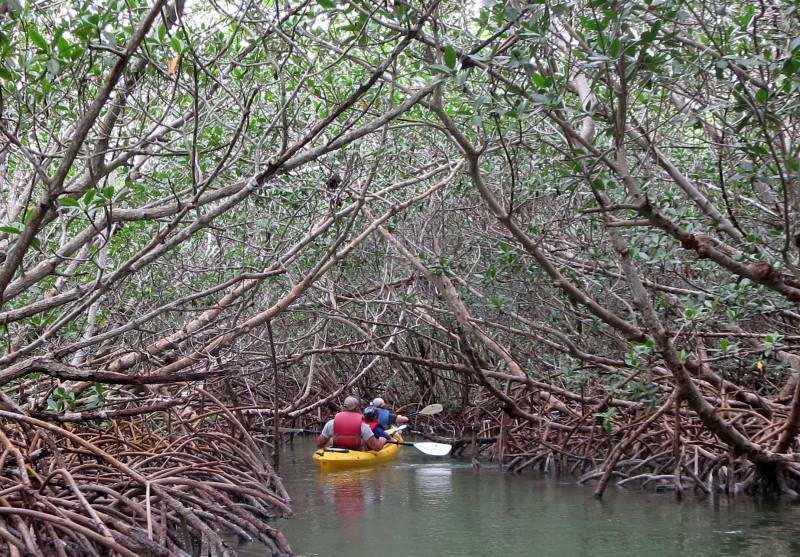 The tour consisted of several stops by the mangroves for show and tell on the local inhabitants of the shallow waters. We saw an inside out snail, a horseshoe crab, a bottom dwelling jellyfish, a sea cucumber and a few other critters. The guide was very enthusiastic and worked well with the grandkids. 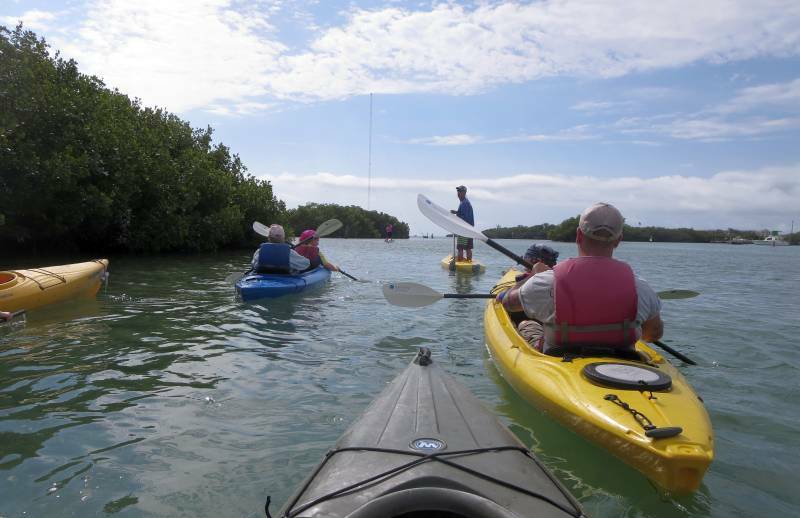 If you're ever in Key West, you certainly ought to take the guided tour. Well, the visit from our daughter and family is coming to an end. They have to catch a plane in the morning in Miami. It's sad to see them go. Mike and Carrie are going out tonight for one more night on the town in Key West. They took the kids to Mallory Square after the sunset when it was deserted for a Sherer tradition, "saying goodbye to the ocean" at the end of a vacation, a sad time. On Tuesday they will leave but not Philip and family arrive to start their one week vacation. They are so looking forward to warm weather after several feet of snow in Connecticut! In fact, to be sure of making the plane they had to get a hotel room at the airport since the snow was predicted to continue through the night. We'll spend Tuesday doing a wash and cleaning the boat to get ready for the next crew, a busy time but great fun.